The Canopy Walk is hung from the primary glulam-wood roof beams with 2-inch-by-3-inch wood tension battens. 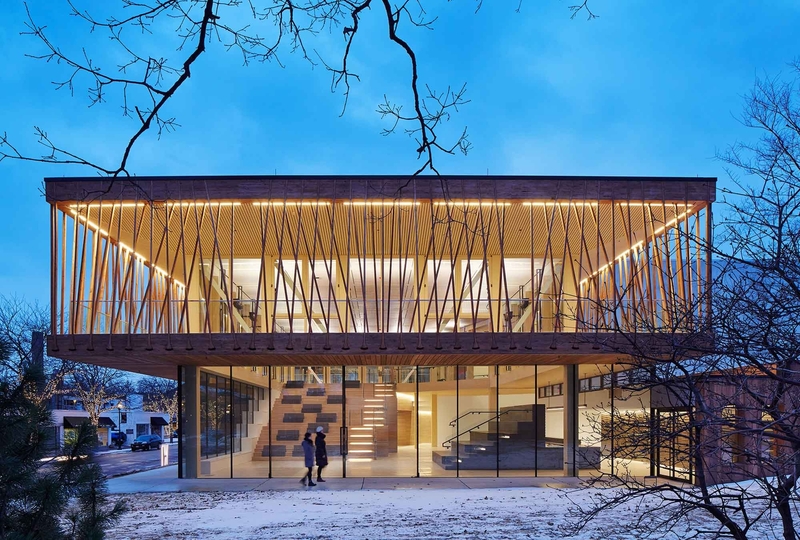 The flared detail at the lower cord connects the battens and glulam beams without any mechanical fasteners. “It’s hanging!” exclaimed one juror. Made locally with conventional woodworking tools, the battens are steamed before the wedges are inserted. 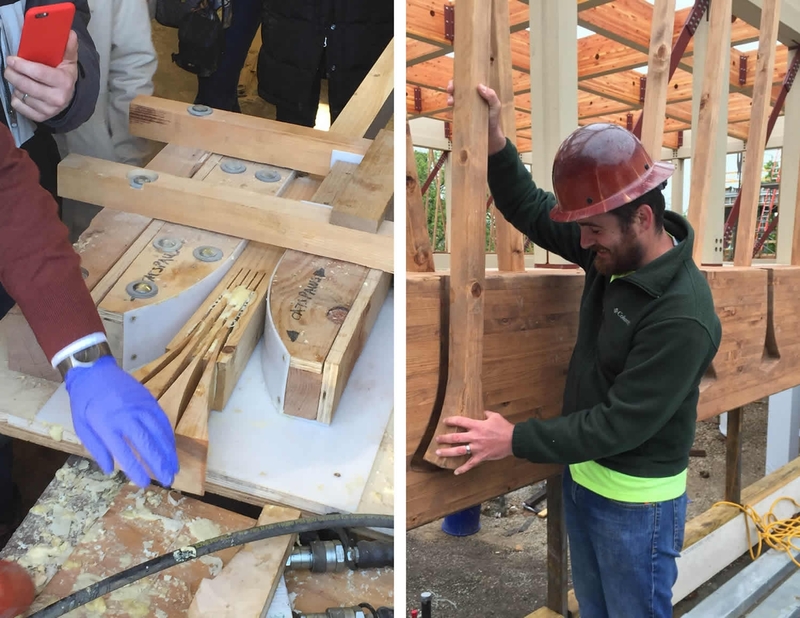 The flared connection is designed to slide in and up into a matching groove in the glulam. An undercut prevents it from slipping forward when in its locked position. “It’s simple and legible,” another juror said. “Any person can look at this detail and understand it.” The screen pattern follows the load path of the structure. Wood battens are bundled at beams to minimize the load at mid-span and are offset to distribute the load evenly. 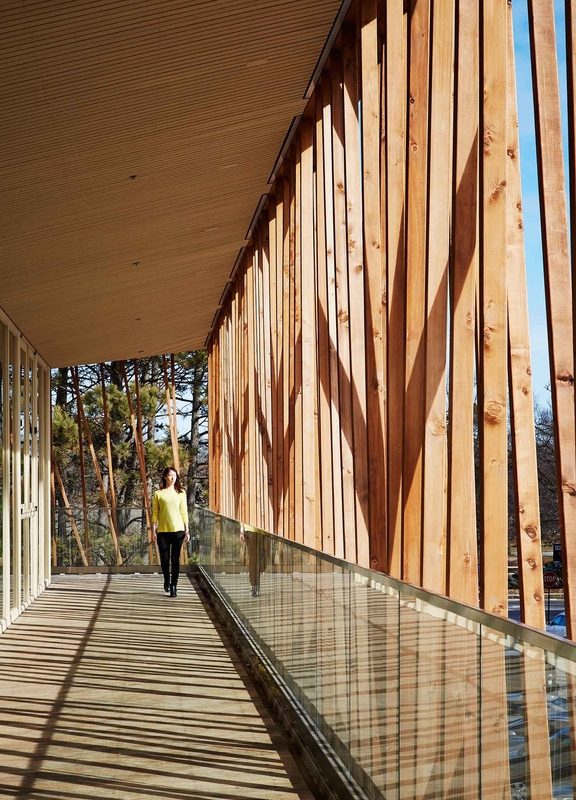 Surrounding the lobby, the Canopy Walk provides a welcoming, comfortable space for people to gather while simultaneously improving the environmental performance of the building through self-shading and, together with fritted glass, reduces bird strikes. The Canopy Walk creates an iconic identity for Writers Theatre, animating the facade through its pattern and experiential quality. “It’s wonderful that someone took so much time and energy to create something so thoughtful,” explained a juror.